Your Business Can Go Green and Pink to Support Breast Cancer Awareness Month! Eco-friendly marketing items are a great way to support your brand, but they can also be a great way to support a cause. From die-cut seed paper shapes to reusable bags, there are lots of different products you can customize that will promote your brand and a cause either through raising awareness or donations. You can print directly on your custom item indicating your plan to donate to a cause, or you can sell your custom branded gear and donate a portion to a cause; either way, both your brand and the cause of your choosing will get exposure and support. October is breast cancer awareness month, so if you act now you can create some customized products that will draw support around a great cause and get your brand noticed. A good marketing tool leaves an impression, and your customers and potential customers will remember your brand from that point forward. Seed paper achieves this goal and is a great way to leave a memorable message with your customers. Seed paper is paper embedded with seeds. The paper we offer is handmade and contains a mix of annual and perennial wildflower seeds. It comes in a wide selection of colors, and it can be die cut or printed on and handed out to your customers. When the paper is planted either outside, or in a planter, the seeds will germinate and sprout into plants. The paper will biodegrade, or break apart, and be reabsorbed into the soil. The process of planting the paper and watching the plants grow allows your customers to engage with your brand. The plants will leave an impression with your customers and remind them about your brand every time your customers see them. This is also a very environmentally-friendly promotional tool since it is completely biodegradable and the living plants, as all plants do, convert carbon dioxide, which is a greenhouse gas, into the oxygen we breath. These 3- or 6-seed paper packs come in a variety of colors and feature a; they can be die cut into a specific shape to make a statement. We can print your contact info, logo, branding message and any other message on the recycled content info card. 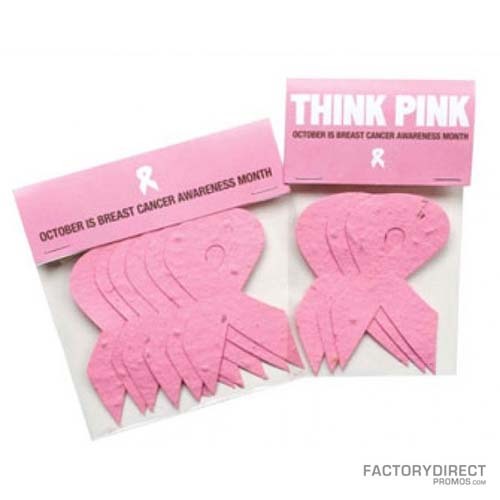 Select pink paper die cut in a ribbon shape to raise awareness and show support for breast cancer awareness month. Given their reusable design bags are a sure to give your brand lots of exposure. Reusable bags are just so useful whether they’re used to carry goods home from the store, or to tote items to and from work, or even as a gym bag. This eco bag features reinforced handles and a spacious storage area, making it super useful for your customers. If you plan to support breast cancer awareness you can consider selecting the dark pink material, or choose the white material and print in pink, either way, this is a durable reusable bag that will hang in there for years of use and promotion. The first step to creating a custom product is getting a quote. In order to create a quote for you we need some basic info – really just the product and the quantity. We turn quotes around very quickly, and once the design is finalized production can take a few weeks. Act fast as your time is limited to get your order in before October’s Breast Cancer Awareness month. As always, if you have questions about any part of the process get in touch and we’ll help you out!